Lipno Lake Resort makes sure that your holiday with children at Lipno will become a memorable and unique experience. That is why our guests benefit from more choices and services included in the price of accommodation than in any other family resort in the Lipno area. The cost of your stay in Lipno Lake Resort´s comfortable apartments with their own saunas, fire places and south facing terraces with the view of the Lipno lake includes all standard services and fees, so with us, you really know how much you pay. There is a fee for pets and some above standard equipment, but no other unexpected fees will surprise you. 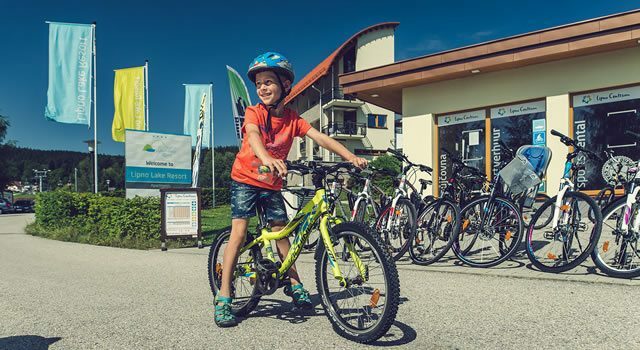 Unlimited free entry to the swimming pools, sports field and children´s playground, children´s corner, ice-skating rink, mini golf and dozens of exclusive discounts for your leisure activities and sports equipment from our own sports rental shop. Lipno Lake Resort is the only accommodation in Lipno which offers its guests free entry to the aqua park in Lipno nad Vltavou from October to May, and to our own heated outdoor salt water pools located on the premises of the resort right under your apartments from June to September. Located directly next to our reception is our sports rental shop, offering top quality equipment all year round. Hire quality sports equipment from renowned brands at discounted prices. Taking care of children and adults alike, our equipment is regularly serviced and our well-trained professional staff is ready to provide you with all you need. When you book your stay in Lipno Lake Resort, you will receive log-in details for the resorts’s mobile phone application – Lipno Lake Resort – Grenzgeinal Guide, at reception during your check-in, along with information brochure. The app gives you access to many vouchers and attractive discounts of up to 50% off for services and attractions in the area. Not only will you save hundreds of Czech Crowns during your stay at Lipno, you will also gain from excellent tips for trips in the surrounding area, which will allow you to plan your Lipno holiday programme. Click here for detailed description of discounts. We at Lipno Lake Resort value our loyal guest greatly and continuously prepare new bonuses and rewards not only as part of the loyalty programme. Our guests can now enjoy many improvements, one of the major ones being the reconstruction of our outdoor heated pools, which will no longer be cleaned with the help of chlorine, but with salt. Lipno Lake Resort´s guests will be therefore the only ones in the Lipno area, who will enjoy free access to pools with salt water. We have placed more loungers, tables and chairs for your relaxation around the pools, the pool kiosk is open from the beginning of June to the end of September. It newly offers freshly squeezed fruit juices, cocktails and soft cone ice-cream made of fresh fruit. Luxury and comfort are the resort´s priorities and all emphasis is therefore put on the quality of your accommodation. You will enjoy newly installed showers and new terrace furniture. Enjoy 5% discount on the third and following bookings after completed second stay. You are eligible to enjoy 10% discount on the fifth and following bookings after completed fourth stay. Our guests will be awarded a voucher in the value of 10% off from their completed 10 stays under the following conditions – reservation must be made via resort´s website www.lipnolakeresort.cz or directly via our reception and has to always be under the same name. The discounts 3+ and 5+ cannot be added up. Only one discount is always valid, depending on the number of realized stays. The voucher can be used only at once and the sum cannot be divided into more parts. Become our loyal guest and enjoy Lipno more than ever before. Don´t spoil your winter fun waiting in the ski-pass queue or threatening over whether you will be able to rent ski equipment, ski instructor or find a free spot in the ski-school for your kids. Easy online ski-school reservation in the Lipno Ski Resort with 15% discount. Open ski-school reservation form here. 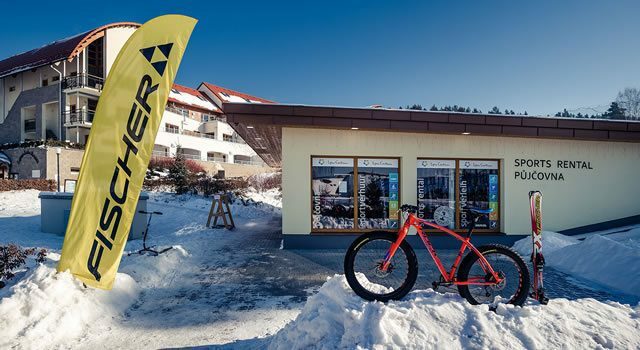 Discounted ski-pass to the Lipno Ski Resort waiting for you at reception upon your arrival. It is necessary to provide exact number of persons and ski-pass types (age, amount of days, dates) when making your booking. Pricelist of discounted ski-passes here. Discounted ski-pass to Frymburk, Hochficht and Sternstein ski areas. It is necessary to provide exact number of persons and ski-pass types (age, amount of days, dates) when making your booking. We are here to take care of your needs, it is our job and we enjoy making it work! All you need to do is to book your stay in Lipno Lake Resort, enjoy the benefits, relax and leave the rest to us. We are looking forward to your visit! Would you like to know more regarding accommodation at Lipno Lake Resort? Do not hesitate to contact us.